People, I have come full circle. 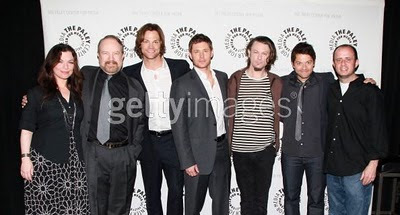 Back in 2006, I was one of the fans who went to the first Supernatural Paley Fest panel, which was the very first congregation of fans of the show, ever. I feel like I get my geek cred just for that alone, but now I've completed the package with a return trip today! And it was just as great as the last time, though it felt shorter. Maybe because I had a ridiculous grin on my face the entire time. It's just like you've heard, and maybe some of you have experienced. The guys? They are just as charismatic and funny in person. More so. Sorry, I don't have the money to be buying these images. If anyone needs me to take it down, just tell me! Today, the guests included: Eric Kripke, Sera Gamble, Jared Padalecki, Jensen Ackles, Misha Collins, Jim Beaver and Ben Edlund. That's also the order they sat on stage, for anyone who needs to know that business. - The reel Sera introduced before everyone came out. It was a great compilation of everything that has been happening in season six so far, with a couple extra treats at the end. The first treat was an extended scene from The French Mistake (the acting scene) plus some outtakes from other bits in that episode. The other treat was a brief couple of scenes for the upcoming Western episode!! Sera said she didn't want to give away what they were going to show, but that a lot of fans were pretty excited about it. I knew immediately that's what it would be. Perhaps I'm a fan, no? - When asked if they had anything they would change, Eric and Misha both had good answers. Misha's we've heard before - he wouldn't do the Castiel gravel voice, as he's totally regretting it now and worried he may well permanently damage his throat. But Eric's was pretty great. He was saying that he has something he'd change in every episode, but one thing that he was reminded of the other day was all the way back in the pilot, when Sam and Dean are walking to the Impala and spouting all sorts of exposition. He cringes every time he hears that, because the other guy would be like "I know! Why are you telling me stuff I already know?!" Ha. I totally get that as a writer myself. Exposition is tough. Jensen then commented how he hates delivering exposition, and that he was happy once the guest stars started having to do it more often. - When Misha was talking about the Cas voice, it segued into Jensen telling a little anecdote of when Misha first appeared on set doing the voice. Apparently everyone thought he was super weird - Jensen even asked the camera guys what he was doing. And later, on set, Jared and Jensen saw him reading or eating or something, and they were like, "He looks like he's in character." and let him be. Asking him then whether he was in character, he was like - nope! And apparently they just all thought he was strange. Haha, it was much funnier in person, trust me. - An interesting tidbit that I've never heard before... someone asked whether Missouri would ever be back on the show again. Personally, I think it's been too long by this point, but anyway. Eric told this story of how she was originally supposed to be in the season one finale. 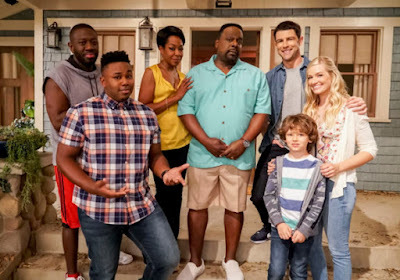 The boys were going to go find her and do the devil's trap stuff with Meg at her place, but in the end Loretta Devine couldn't do it, so they ended up having to come up with a new character... one Bobby Singer! Just think, we never would've had Bobby! - That story made way for another story of how Bobby got his name. As you should know, Robert Singer is one of the exec producers on the show. When they were coming up with this character, Eric wanted to name him after both Bob and Kim Manners, so he was originally supposed to be named Bobby Manners, since Eric looked up to the both of them. But, it turned out that there was a Bobby Manners who lived in South Dakota, so they couldn't do that. And because Bob wasn't in the office that day, Eric named him Bobby Singer! - Jared making fun of Eric's bad guy voice was pretty hilarious. Eric apparently always does the same voice whenever he's acting like he's whatever bad guy is around. You really had to be there for this one, but it was super funny. - For those wondering whether we will ever get a Castiel-centric episode similar to how Bobby got one earlier this season, wonder no longer. Ben Edlund confirmed that he had just finished directing his first episode, and it happened to be a Cas-centric one. I believe it's episode 20. - Eric emailed the director/producers after seeing his death scene from French Mistake, thanking them for killing him in such a badass way, as that was not how it was originally written. Speaking of French Mistake, Misha really wanted the version of himself to be a total douche. Jensen commented that he laughed a lot at Misha's death scene, and then commented that that was sort of weird. Haha. - Eric has a specific coda in mind for when the show comes to an end - where everyone would end up. There was more than that, of course, but I assume they're going to have it all on DVD soon enough. I'm really glad I went, even though I was up in the nosebleed section. Oh well, they had a huge video screen. I just love that everyone seems to get along so well, they all seem to genuinely like each other. If you have any questions about the panel, feel free to ask away in the comments!! OMG. That was so cool! Thank you for sharing. I for one am grateful that Missouri did not make a comeback (I loathed that character like whoa). Yay to Bobby Singer! I think you are in the minority about Missouri, haha. Most people seem to like her character. But I'm definitely glad her absence paved the way for Bobby. Glad to share. It's one perk of living in LA!